Abstract. An unusual ice type, called hair ice, grows on the surface of dead wood of broad-leaf trees at temperatures slightly below 0 °C. We describe this phenomenon and present physical, chemical, and biological investigations to gain insight in the properties and processes related to hair ice. 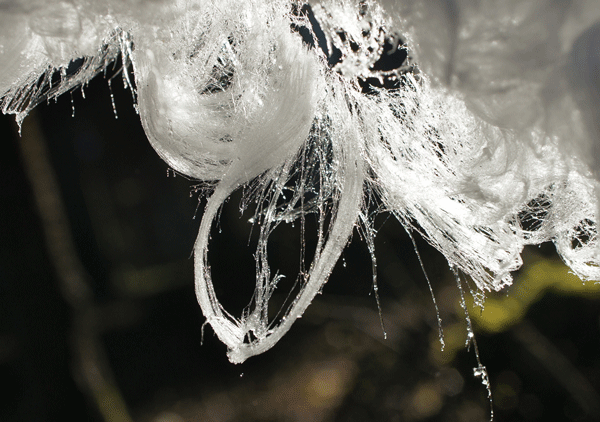 Tests revealed that the biological activity of a winter-active fungus is required in the wood for enabling the growth of hair ice. We confirmed the fungus hypothesis originally suggested by Wegener (1918) by reproducing hair ice on wood samples. Treatment by heat and fungicide suppresses the formation of hair ice. Fruiting bodies of Asco- and Basidiomycota are identified on hair-ice-carrying wood. One species, Exidiopsis effusa (Ee), was present on all investigated samples. Both hair-ice-producing wood samples and those with killed fungus show essentially the same temperature variation, indicating that the heat produced by fungal metabolism is very small, that the freezing rate is not influenced by the fungus activity, and that ice segregation is the common mechanism of ice growth on the wood surface. 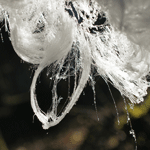 The fungus plays the role of shaping the ice hairs and preventing them from recrystallisation. Melted hair ice indicates the presence of organic matter. Chemical analyses show a complex mixture of several thousand CHO(N,S) compounds similar to fulvic acids in dissolved organic matter (DOM). The evaluation reveals decomposed lignin as being the main constituent. Further work is needed to clarify its role in hair-ice growth and to identify the recrystallisation inhibitor. How to cite: Hofmann, D., Preuss, G., and Mätzler, C.: Evidence for biological shaping of hair ice, Biogeosciences, 12, 4261-4273, https://doi.org/10.5194/bg-12-4261-2015, 2015.